On the China trip I enjoyed the Shanghai street food more than that of Beijing but not sure if that really represnted differences in the cities of just where I happened to go. 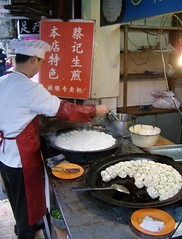 These Shanghai dough balls had a rolled pork ball in the middle and were then steamed and fried on one side. Yum! However my favorite dish during the 14 day trip was the simple, but simply perfect Wonton Soup served near our hotel in Shanghai. This entry was posted in china, shanghai, tourism, travel and tagged china, shanghai, travel. Bookmark the permalink. Yummm – I’d worried a lot about eating off the street but the biggest thing I’m missing about the China trip are the street foods of Shanghai.